Okay, here you have the photos for the 2009 Prairie Scenes calendar. Same type of calendar as last year but the page style is different as well as the photographs for each month. So, the prices will be the same as last year: $2.00/each with black imprint and $2.50/calendar with color imprint for your logo and business information. There is a $30.00 design fee and also, if you order more than 1 type of calendar, there is a $10.00 charge for each additional calendar type. For example, if you wanted 100 of all 3 calendars, you would pay an additional $20.00 for the 2 different extra calendar types. 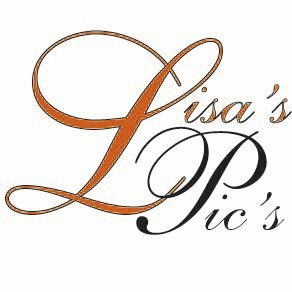 Please remember that it is illegal to copy photos so please honor that and do not copy these photos for any reason. If you have a request, please contact me personally. Thanks! 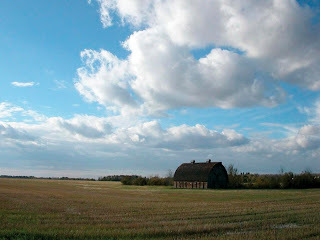 This photo that I chose to use for the cover was taken at Batoche National Park. I attended a class trip with my one daughter and her class one spring - it was a field trip for the day. I hadn't been here since I was a child myself. My have they made some beautiful upgrades to this place - it was a wonderful day with my daughter and her friends. This has got to be my favorite photograph in this calendar. My family was so incredibly blessed this past winter when we were in the Shell Lake, SK area. 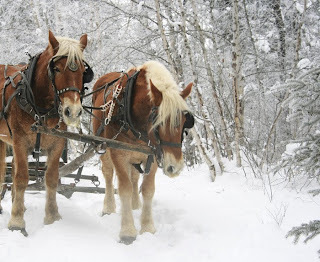 We had asked a fellow who had some horses if he would take our family on a sleigh ride over the Christmas break. Well he willingly did this for us and the day we chose, God blessed us with another frosty day. The ride couldn't have been more beautiful! We had family over from out of the province and they had never been on a sleigh ride before - so it was great to experience this with them. This photo just makes the perfect January photograph. These horses were just gorgeous! the February photo I took while I was on a day trip skiing with my daughter and a couple of classes from her school. We had gone out to Table Mountain, which is near North Battleford, SK. 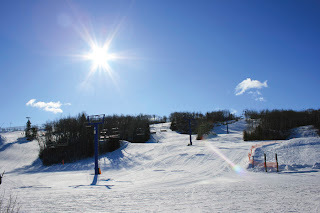 It is a hotspot in Saskatchewan - a favorite place to go skiing in winter. It's settled on the banks of the river that runs through North Battleford. It was a beautiful sunny day, quite mild but very windy. for March I chose this photograph that I took while I was out driving to Kuroki to pick up some meat for my hubby. 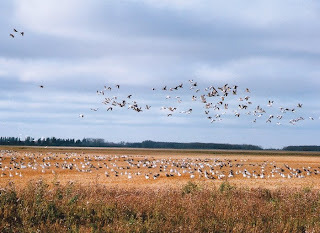 Near Fishing Lake, SK the snow geese were just all over the fields - it was beautiful! What a sight they are to see. I had never been to that part of Saskatchewan before - I quite enjoyed the drive - beautiful area up there. I couldn't believe the high water levels on Fishing Lake - some of the cabins and homes were nearly flooded out. Here you also see a sample of the calendar month page in April. 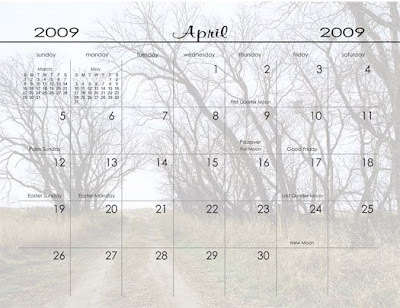 Each month will have a ghost photo of the original photo displayed under the days of the month as you see above. I love the effect it has for each month. Hope you like it. Butterflies! I just love butterflies. 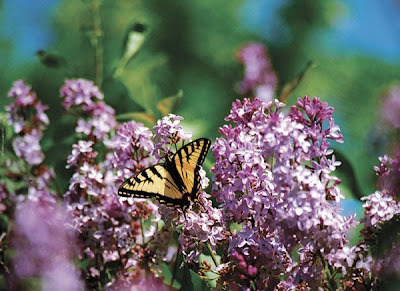 One day in May, I followed this little guy around in the lilac bushes for quite some time taking a variety of photographs of it. Each one is so unique and different - one of a kind - just like us humans. :-) We were up in the Shell Lake, SK area when I took this photograph. In June, my kids often played baseball but living in a small town, you had to drive out to the other small towns to play ball. When you had kids on different teams, and had to drive to 3 or 4 different games each week, well, you covered a fair amount of miles in good ole Saskatchewan. This particular day, we had driven out to Cudworth, SK for a game. 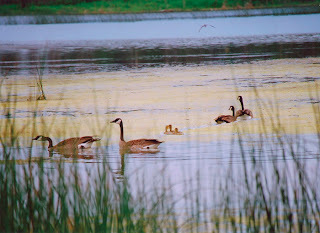 When we were leaving, we drove past this big body of water and I saw these geese with their little ones. I stopped the car and walked out in the bulrushes to take this photograph - it was well worth it - I love the shot! 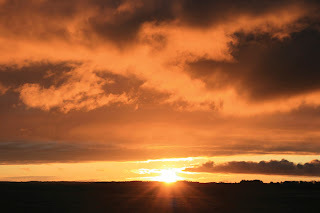 We were driving to Shell Lake one weekend and there was the most beautiful sunset as we were on the highway near Big Shell Lake, SK. The skies were just an array of colors and the sun was peaking through them, just over the horizon. It was incredible. How beautifully God paints the skies for us at the end of each day. I thought it would make a great July photograph for the calendar. 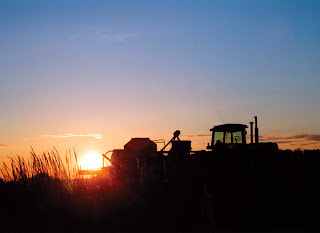 One day when we were driving back from a ball game at Wakaw, we were close to Rosthern, SK when we saw this tractor standing in the field with the sun going down behind it. I've always wanted a shot like this and now God was giving it to me. :-) I think it looks so cool. August is often the month when the harvest comes in so it's very suitable for this month. One September, my hubby and I and another couple had gone quadding up at Chitek Lake - they've got great trails up in that area. On our way back as we got closer to Spiritwood, SK we saw this old barn on the west side of the highway that I just had to photograph. I love old barns and abandoned homesteads and taking photographs of them - they make great black and white pictures too. One fall, my hubby and I were staying up at Emma Lake for our anniversary. We had gone for a drive through the Waskesiu National Park, SK - the day was gorgeous, the fall colors were beautiful and the skies were clear blue. As we drove along, listening to praise and worship music, I told God that it would be so great to see a bear right now. And you know what?? We drove around the curve, and there was a bear eating berries in the ditch right alongside the road. We stopped and he just continued eating. 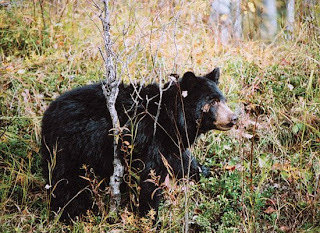 As we were sitting in the car watching the bear, I took about a dozen photographs of him - he loved posing for me. :-) It was incredible sitting there watching this amazing animal - I wanted to go out there and hug him, he just looked so huggable. :-) I didn't though. Sure worked good for this October spot in the calendar. 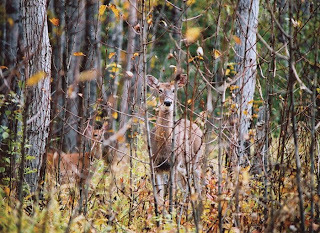 The same drive that we had taken through Waskesui National Park, SK we came across dozens and dozens of deer - big and small. One of my favorites I had put in the 2008 calendar. Here is another one of my favorites from the great photo opportunity day - these 2 deer watching us through the trees. They are such a graceful animal. I love watching them. I decided to put it in for this November month - often we haven't had any snow yet and the leaves have still been sitting, all dried up on the trees, not having all fallen off yet. Precious memories!! It was a beautiful, December day and the trees were filled with frost. The skies were almost clear and the sun was on it's way going down for the night. It's often at that time when the colors are so rich and blue. 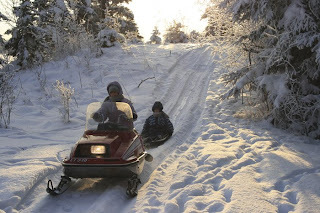 I took the girls out on the snowmobile through the trees on some private land at Memorial Lake, SK and had a wonderful time slowly touring in the trails, listening to the birds, seeing deer and looking out at the lake all covered in snow and ice. It is a winter wonderland up in this area. 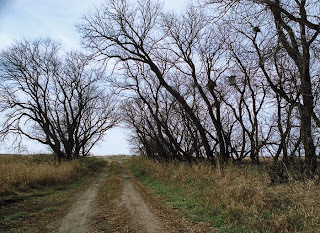 I hope you've enjoyed viewing the pages for the 2009 Prairie Scenes calendar.